This paper details field investigations that were conducted on the performance of small capacity urban retrofit stormwater control measures. The objective of the two year study (2013–2015) was to provide performance data on stormwater retrofits that could not be fully sized according to conventional standards due to space constraints. In many states performance credits are not granted to stormwater management controls that are not designed to manage regionally derived water quality volumes. In retrofit applications there may exist numerous limitations to conventionally sized systems such as limited rights of way, setback distances or existing utilities. The larger scale objective of green infrastructure implementation is to improve receiving water quality and therefore even undersized systems, to some extent, meet this objective. This study introduces data on two systems: an innovative bioretention design with a water treatment residual amended filter media and an internal storage reservoir; and an undersized linear subsurface gravel wetland sized to optimize both phosphorus and nitrogen removal. The systems were retrofitted into existing developed areas and were sized at less than the water quality volume due to limited space at each location. The bioretention system (IBSC) was constructed in a commercial area in the town of Durham, NH in summer 2011 and the subsurface gravel wetland system (SGWSC) was constructed in a narrow drainage right of way in a residential neighbourhood of Durham, NH in the fall of 2013. Sediment and metal removals for both undersized systems were high with median removal efficiencies in the SGW of 75% for both total suspended solids (TSS) and total zinc (TZn). The Durham IBSC recorded median removal efficiency (RE) of 86% for TSS and TZn. Total phosphorus (TP) REs were higher than conventional bioretention systems with the subsurface gravel wetland system achieving a median RE of 53% and the Durham IBSC achieving a median RE of 40% for TP. Both systems reduced total nitrogen (TN) by approximately 20% (23% for SGWSC and 21% for Durham IBSC) with median effluent concentrations of 1.4 mg/L. This project was funded by the U.S. Environmental Protection Agency Region 1, Regional Applied Research Effort (RARE) Program. Additional information can be found in the full project report Performance Analysis of Two Relatively Small Capacity Urban Retrofit Stormwater Controls (Houle et al. 2015). Stormwater runoff is a leading contributor to water quality and aquatic life habitat impairments in New England surface waters (NHDES 2014). Stormwater associated pollutants, such as sediment, nutrients (nitrogen and phosphorus), pathogens, trace metals, and petroleum hydrocarbons that accumulate on impervious surfaces, readily wash off during rain events and pollute nearby receiving waters. Increase in impervious surfaces continues to be a threat to the quality of receiving waters. Numerous scientific investigations have explored the relationship between the biological or ecosystem health of streams and the amount of impervious surface in associated tributary watershed areas. Results of these investigations consistently reveal that even relatively small amounts of untreated impervious surfaces in tributary drainage areas are a significant causative factor to aquatic life impairments and nonattainment of water quality standards (Klein 1979; Schueler 1994; Booth and Jackson 1997; Schueler et al. 2009; Weiskel et al. 2009; Armstrong et al. 2011). Stormwater management in developed watersheds, often referred to as retrofits, presents a unique challenge of achieving compliance with evolving permit requirements while maximizing the use of limited financial resources and limited space. To that end, stormwater managers need to be able to optimize a mix of controls, and choose from a menu of control practices and varying design capacities that have credible performance information and may be implemented across the development environment for a variety of site conditions and space constraints. Pollutant removal mechanisms in stormwater control measures (SCMs) vary depending on the pollutant of concern. Phosphorus is most effectively removed by filtration and sorption in unsatur- ated soil media whereas nitrogen is most effectively removed by denitrification in saturated, anaerobic zones. Media amendments have recently been used to increase the phosphorus scavenging capacity in media filters. The ability of natural wetlands to remove nitrogen from the lithosphere and hydrosphere has been mimicked in constructed SCMs, such as subsurface gravel wetland systems, to include internal storage reservoirs that maintain saturated, anaerobic conditions to increase denitrification. Drainage area characteristics and a comparison of conventional design characteristics versus actual monitored system design characteristics for the two systems considered in this paper are presented in Table 1. Table 1 System design and drainage area characteristics. each monitored system was designed with a different sizing method: the static design method sizes the SCM to hold the full depth of runoff treated at any one time within the basin or cross-section of the system; dynamic design includes the capacity in the system geometry as well as the infiltration rate of the native soils and effluent flow rate through an outlet control. The bioretention soil mix (BSM) in this study utilized a media amendment, water treatment residuals (WTR) to enhance phosphorus scavenging. Many drinking water treatment plants use polyaluminum chloride (PACl) as a coagulant for drinking water treatment. The sludge that settles after the coagulation–flocculation process contains amorphous aluminum and iron (hydr-) oxides, which are highly reactive with dissolved phosphorus and have a large surface area for adsorption (Lucas and Greenway 2011b; Makris et al. 2004). According to Makris et al. (2004), WTRs contain internal micropores in which diffusion occurs. An elevated activation energy of desorption within the micropores immobilizes sorbed phosphorus, thereby increasing its stability. Critical to the use of WTR is processing to reduce the water content of the sludge material which is typically generated at the water treatment plant in the range of 90% to 99%. Freezing the WTR sludge is a common strategy to decrease water content in WTR. Since 2012 UNHSC researchers have been generating WTR through a wintering process that decreases water content to the range 50% to 60% and results in a granular material with the consistency of coffee grounds that can be readily blended with bioretention soil mixes at roughly 3% to 5% by volume. The anaerobic zone in the internal storage reservoir (ISR) is maintained in the subsurface gravel wetland (Figure 1 below) or a modified bioretention system (Figure 2 below and Figure 3 below) by the installation of an elevated outlet combined with low permeability of the native soils below the system. Native soil below the gravel layer is compacted or lined to discourage infiltration such that the gravel layer does not drain between storms and remains saturated. Figure 1 Plan and profile view of monitored SGWSC. Figure 2 Plan view of monitored IBSC. The dissolved organic carbon in stormwater and that generated by the vegetation in the system itself enable the ISR to become anaerobic due to bacterial respiration activity. The mechanisms for nitrogen retention and removal are typically slower processes than those which remove other pollutants. Some of these processes occur between, rather than during, rain events in a system. Subsurface gravel wetland systems tend to have large footprints due to the need for an extended travel path. UNHSC design specifications recommend a minimum horizontal flow path length of 30 ft, 9.1 m (UNHSC 2016). One study concluded that nitrogen retention is a rate dependent process, based on a study of outlet controlled bioretention mesocosms, which removed more than double the nitrogen oxides (NOx) and total nitrogen than their free flowing counterparts (Lucas and Greenway 2011a). By combining elements of each of these systems (filter media from the bioretention system and an internal storage reservoir from the subsurface gravel wetland), removal of both nitrogen and phosphorus should be improved over typical bioretention designs. Stormwater samples were collected using ISCO Model 6712 Automated Samplers with stainless steel strainer, 3/8 in. (19.1 mm) inside diameter vinyl collection tubing and 24 discrete 1 L low density polyethylene (LDPE) sample bags. All automated sampling units were weatherproofed or sheltered to maintain manufacture operation specifications. All samplers were secured with locks to maintain sampler and sample integrity. All samplers were controlled by an internal thermostat to maintain 39 °F (4 °C) temperatures within the sample storage area. All monitoring methods throughout the study were governed by a U.S. Environmental Protection Agency (USEPA) approved quality assurance project protocol (QAPP). The objective of this study was to evaluate the effectiveness of small capacity stormwater retrofit systems, including the implementation of a subsurface gravel wetland system control (SGWSC) and an innovative bioretention system control (IBSC). The overall assessment of project effectiveness was conducted through influent and effluent water quality sampling in each system. Pollutant event mean concentrations (EMCs) were evaluated at the influent and effluent to each system for each monitored storm event. Pollutant removal efficiency, represented as a percentage, was developed for each system and refers to the overall pollutant reduction from the inflow to the outflow of each system. EMCs are a parameter used to represent the flow proportional average concentration of a given water quality parameter for a storm event. It is defined as the total constituent mass divided by the total runoff volume. The EMC data collected during this study were based upon direct measurement from flow weighted composite samples. Storm characteristics such as total depth of rainfall, peak intensity, total storm volume and antecedent dry period, among others, were collected for each storm event. Results for all storms sampled are presented in Figure 4 (Oyster River Road SGWSC) and Figure 5 (Durham IBSC). Due to the variability of precipitation events and resultant runoff conditions, the sample trigger conditions and flow weighted sample pacing were variable and adjusted on a storm by storm basis according to the most up-to-date precipitation forecasts. Figure 4 Simple statistics summarizing monitoring results for Oyster River Road SGWSC. Figure 5 Simple statistics summarizing monitoring results for Durham IBSC. EMCs are compared for each pollutant parameter using simple statistics. The data provides a basis to evaluate the primary study question: to discern whether the SCM has produced observable (and perhaps statistically significant) improvement in water quality. The statistical analyses presented in this paper reveal a range of performance trends. Efficiency ratio (ER) analysis was performed on the final dataset. 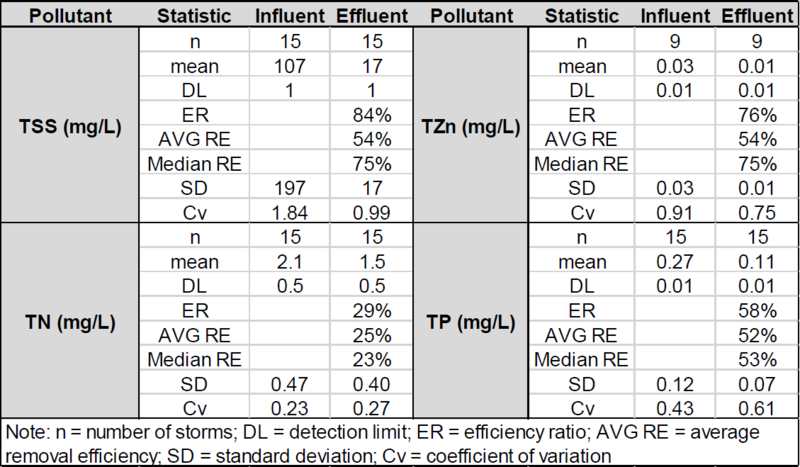 For many performance datasets for stormwater treatment systems, the ER is a stable estimation of overall treatment performance as it minimizes the impact of low concentration values, or relatively clean storms with low influent EMCs. 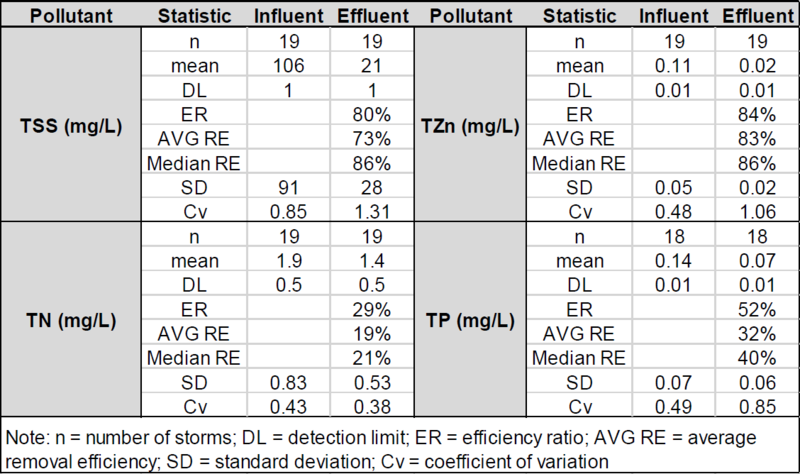 Whereas removal efficiencies (REs) reflect treatment unit performance on a storm by storm basis, ERs weight all storms equally and reflect overall influent and effluent averages across the entire data set. RE is presented as both an average and median of aggregate storm values. In general aggregate median RE values are more reliable in highly variable, non-normally distributed datasets such as those experienced in stormwater treatment unit performance studies. A review of REs on a per event basis, ERs for the entire period of monitoring, and EMCs per event will reveal the measured performance variations attributable to season, flow, pollutant concentration, and other factors. Cv = coefficient of variation which is the ratio of EMC SD to mean EMC; this gives the level of variability in the data set: the lower the Cv the more consistent the values in the data set. The cumulative distribution of all rainfall depths is shown in relation to overall design storm for each system in Figures 6 and 7. 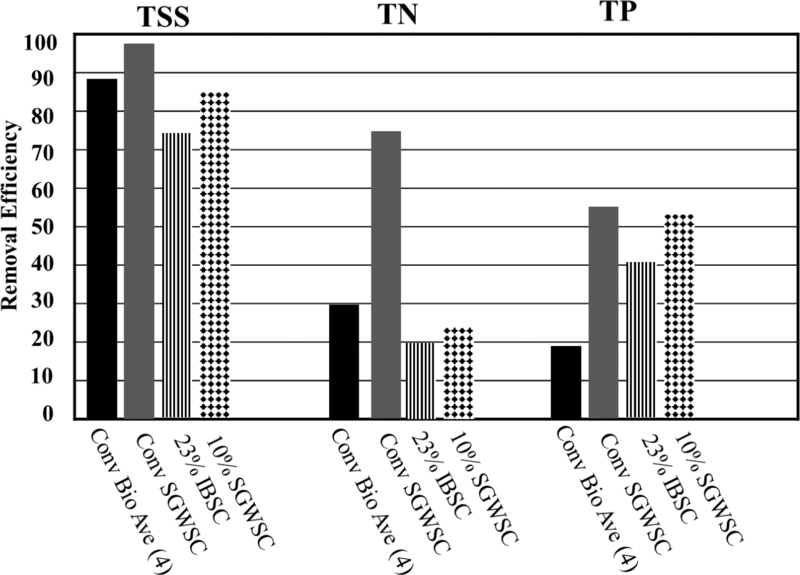 Removal efficiencies for total suspended solids (TSS), total nitrogen (TN), and total phosphorus (TP) are presented in Figure 8 alongside those for conventionally sized systems studied previously. Figure 8 Comparative removal efficiencies for common pollutants for conventionally sized systems studied previously and for undersized systems in this study. Many modelling and regulatory approaches only credit system pollutant removal efficiencies and subsequent pollutant load reduction for full sized systems. This assumption insinuates that if fully sized systems are impractical for a variety of site specific reasons then there is no value in an undersized strategy. This study underscores the benefits of opportunistic implementation of SCMs. In other words, the data indicate that the benefits from opportunistic sizing of SGWSC or IBSC exceed linearly scaled performance expectations of appropriately sized SCMs. Appropriate sizing assumes that we understand the hydraulic routing and unit operations and processes responsible for pollutant load reductions. This study indicates that conventional sizing, modelling, and design criteria are conservative especially with respect to TSS, TP, and TZn removal and do not accurately represent the hydraulic routing or the long term performance of innovative SCMs. Larger capacity SCMs or additional system modifications will still be needed to minimize the delivery of TN. This has very important planning and economic implications as many systems are modelled with routine assumptions with respect to performance and never verified or calibrated by real time flow data. These monitoring data highlight the cumulative benefits provided by smaller capacity systems (undersized) in regions like New England where the vast majority of rain events are small in size. It is necessary to account for all rain events and especially the more numerous, smaller sized events that are capable of washing off significant amounts of pollutants from impervious surfaces in order to most effectively address the long term cumulative impacts of stormwater runoff. An important aspect of the design and selection of green infrastructure is to recognize that the ultimate intent is to improve receiving water quality as well as to address impairments. Therefore, green infrastructure systems should be selected with the receiving water characteristics and impairments in mind. Special thanks to funding and support provided by the U.S. Environmental Protection Agency Region 1, Regional Applied Research Effort (RARE) Program, and to Mark Voorhees and Steven Rego for assisting with project implementation. Armstrong, D. S., T. A. Richards and S. B. Levin. 2011. Factors influencing Riverine Fish Assemblages in Massachusetts. Reston, VA: U. S. Geological Survey. Scientific Investigations Report 2011-5193. http://pubs.usgs.gov/sir/2011/5193/pdf/sir2011-5193_text_508.pdf. Booth, D. B. and C. R. Jackson. 1997. “Urbanization of Aquatic Systems: Degradation Thresholds, Stormwater Detection and the Limits of Mitigation.” Journal of the American Water Resources Association 33 (5): 1077–90. Houle, J. J., T. B. Ballestero and T. A. Puls. 2015. Performance Analysis of Two Relatively Small Capacity Urban Retrofit Stormwater Controls. Durham, NH: University of New Hampshire Stormwater Center https://www.unh.edu/unhsc/sites/unh.edu.unhsc/files/UNHSC_Final%20Report_Jul-2015.pdf. Klein, R. D. 1979. “Urbanization and Stream Quality Impairment.” Journal of the American Water Resources Association 15 (4): 948–63. Lucas, W. C. and M. Greenway. 2011a. “Hydraulic Response and Nitrogen Retention in Bioretention Mesocosms with Regulated Outlets: Part II—Nitrogen Retention.” Water Environment Research 83 (8): 703–13. Lucas, W. C. and M. Greenway. 2011b. “Phosphorus Retention by Bioretention Mesocosms Using Media Formulated for Phosphorus Sorption: Response to Accelerated Loads.” Journal of Irrigation and Drainage Engineering 137 (3) 144–53. Makris, K. C., H. El-Shall, W. G. Harris, G. A. O’Connor and T. Obreza. 2004. “Intraparticle Phosphorus Diffusion in a Drinking Water Treatment Residual at Room Temperature.” Journal of Colloid and Interface Science 277:417–23. https://doi.org/10.1016/j.jcis.2004.05.001. New Hampshire Department of Environmental Services (NHDES). 2014. Great Bay Nitrogen Nonpoint Source Study: Final Report. Concord, NH: NHDES Water Resources and Air Resources Divisions. R-WD-13-10. http://www.des.nh.gov/organization/divisions/water/wmb/coastal/documents/gbnnpss-report.pdf. Schueler, T. R. 1994. “The Importance of Imperviousness.” Watershed Protection Techniques 1 (3): 100–11. Schueler, T. R., L. Fraley-McNeal and K. Cappiella. 2009. “Is Impervious Cover Still Important? Review of Recent Research.” Journal of Hydrologic Engineering 14 (4): 309–15. https://doi.org/10.1061/(ASCE)1084-0699(2009)14:4(309). Weiskel, P. K., S. L. Brandt, L. A. DeSimone, L. J. Ostiguy and S. A. Archfield. 2009. Indicators of Streamflow Alteration, Habitat Fragmentation, Impervious Cover, and Water Quality for Massachusetts Stream Basins. Washington, DC: U.S. Department of the Interior, U.S. Geological Survey. Scientific Investigations Report 2009-5272. http://pubs.usgs.gov/sir/2009/5272/. University of New Hampshire Stormwater Center (UNHSC). 2016. 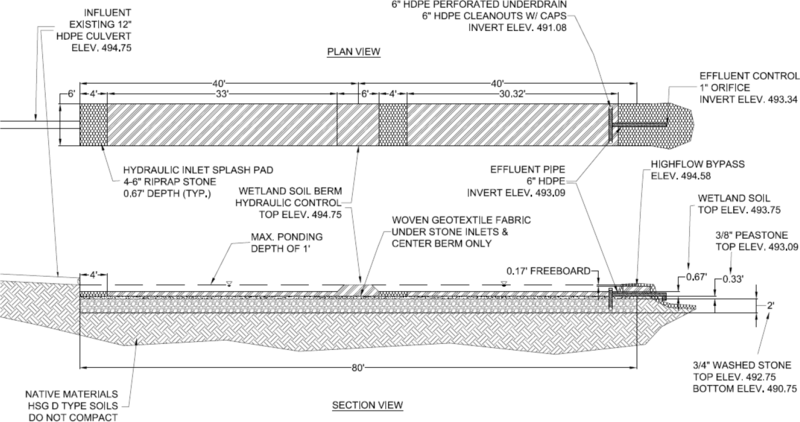 UNHSC Subsurface Gravel Wetland Design Specifications. Durham, NH: University of New Hampshire Stormwater Center. https://www.unh.edu/unhsc/sites/default/files/media/unhsc_gravel_wetland_spec_6-2016.pdf.